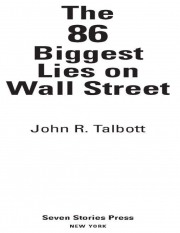 Description of "The 86 Biggest Lies on Wall Street (eBook)"
John Talbott is an economic consultant who has authored academic papers on economic growth and development and made presentations on the subject to the governments of Russia, Jordan, and Qatar. A visiting scholar at the Anderson School at UCLA, Talbott is also a former vice president in the investment banking division of Goldman, Sachs, and Company. Reviews of "The 86 Biggest Lies on Wall Street (eBook)"